Radiation Protection | Tamar Laboratory Supplies LTD.
Scie-Plas manufacture the complete range of radiation protection products. Using the 10mm thick optical acrylic products for shielding beta emissions of 32P, 35S, 3H and 14C in biological research is an ideal solution. Being transparent, the visibility of the working environment is not impaired. 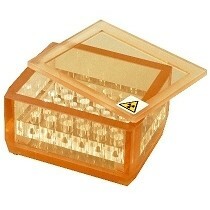 We offer Work stations, shields, boxes for 0.5 & 1.5 ml microtubes, and containers for the disposal of radioactive waste.